So with the USB option you are charging batteries as well? So it wouldnt have to plugged in all the time? Wayne Goguen That's right. You can use two large-capacity USB batteries (we use these at our shows and they work great). You'll still need two batteries but once they're charged, you'll be able to locate them under the table (or in some other location inside the table) and power the Falcon from them. I love the table by the way! Thank you for sharing. You have a beautiful setup. Thanks for your time and quick responses. I will check out those batteries and you will be hearing from me in regards to your kit. I'm interested in purchasing the premium kit, but can't seem to decide which power supply to purchase. Do you happen to have pictures of the USB powered kit? I'm wondering how visible the wires are if it were to be mounted externally. Then you'd be all set! I hope this information is helpful-- please let us know if you have any additional questions. Thank you for your interest in our kits! Pre ordered the Premium All in one Kit with Dual USB power supply this morning! Can't wait for April! Now to get planning on the coffee table and docking bay ! Tom Moisey Awesome, thank you so much for buying the kit! Adrian Love Hi, thank you very much for your purchase! You'll need two USB power cords (one for the sound components and the other for the lights). We can create a coupon code for free shipping that you can use to place a new order for the USB cables, then we'll ship everything together when your order is ready. Just send us an e-mail (support(at)brickstuff.com) with your order number and we'll get it taken care of. Rob Klingberg Can I plug the USB cable right into a Branch 4 1:2 adapter? then run a 24 inches thin black cable from the other end of that Branch 4 to the power input of the infrared control module that is inside my flacon? Wayne Goguen Nice... custom cabinet or you bought it like this? Christian Nanini it was a custom build. I am very happy how it turned out. I thought everyone might want to see how our light and sound kits are shaping up. 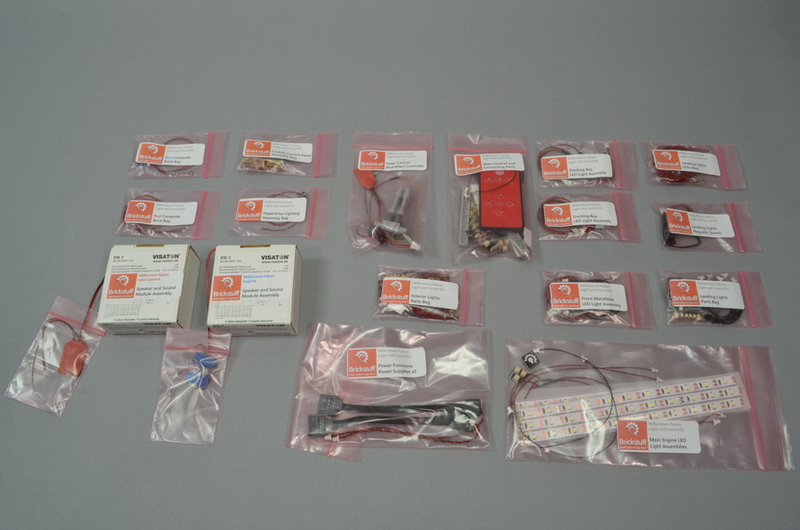 We have finalized the parts list and finalized the configuration of the kits. The photo above shows the 17 bags and boxes of parts that will go into the kits. It's our largest kit ever, and I know people are going to love it. Quick question, its relating to another project I've got planned but what is the hight of the adaptor boards and LEC units ? 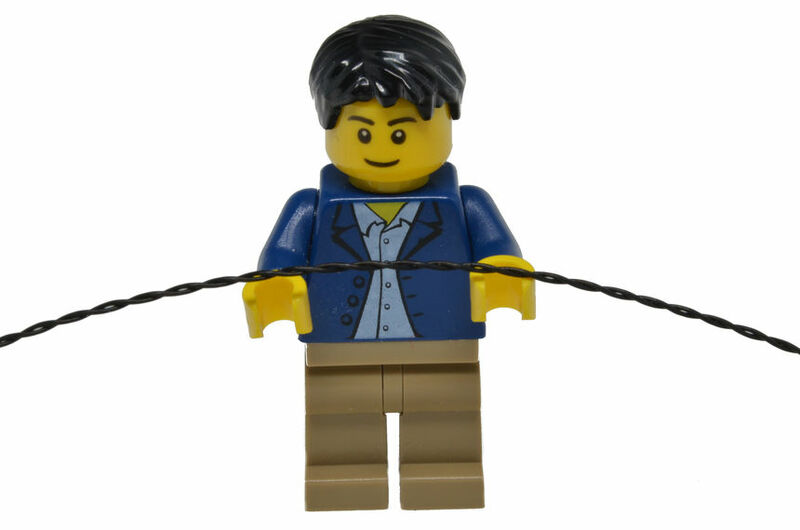 I have a scene planned that i want to build, but have all the wires and controllers hidden within the lego. Tom Moisey That may be an "it depends" question - the 2:1 adapters are the size of a 2x2 plate (studs included, though I don't have it in front of me), so you'd be looking at a 1-2 plate height void (minimally one for the adapter itself, but I *think* you'd need the clearance of two, unless the underlying layer was a tile - sans studs - for clearance. Some of the LECs - flashing beacon, flickering torch - are this same footprint (2x2 plate). The Single Function LEC is a 2x6 plate size. With both, you'll need the clearance on either end for wires to enter and exit, of course. As always, Rob Klingberg will keep me honest, but as rough estimates (not in front of my BrickStuff stuff right now), that should get you into the ballpark -- and depending on the size and complexity, some consideration for a wire channel / path is a worthy consideration... this would help avoid the pains I'm currently going through when you want to rearrange, expand, or - gasp - troubleshoot pinched wires. Paul George Thanks for the info! Should fit with my plans. The main scene will be built on a base frame of bricks and technic beams, so i can keep the control modules underneath and run the wires out of sight as well. 1- Prices are in US dolars? 2- Do you ship to Brazil? Does it goes with an international tracking number? 3- Is it possible to have the kit powered with USB chargers and later on change powering to Lego PF batteries? Or do I have to commit to a powering option upon time of order? We definitely could ship to Brazil. I'd recommend using International Priority Mail, which would be free with the purchase of the Falcon kit. Just make sure to select Priority Mail at checkout. This does provide an international tracking number. You do not have to commit to a permanent powering option now. If you buy the USB version and want to switch to PF later, you'd just need to buy two of our PF power supplies (and LEGO batteries of course). Please let us know if you have any additional questions, and thank you for your interest in our Falcon kit! Rob Klingberg thanks for the prompt reply. Do you have a time limit for the "free international shipping" offer? Floriano Paes Hi for the Premium Kits like the Falcon, we are likely to keep the free shipping. So I've got my pre-order in and I just got my Falcon this weekend. Would it be possible to go ahead and download the instructions for the lighting kit so I can anticipate where things are going to go when the lights ship in June? Thank you, Eric. Rob Klingberg Re: USB vs PF, I was under the impression that the main difference between the USB and PF were just the specialized cables needed to connect the Lego batteries. So there's an actual power supply that needs to be in there as well? Eric Stiff with USB, you don't use LEGO batteries but can connect the cables either to two USB power banks or to two mains adapters (like iPhone/iPad type chargers). With the PF power option you can use two LEGO batteries and have them located inside the Falcon. With USB, power is external. More information about power is available on the FAQ page of the Falcon site: http://www.lightmyfalcon.com/frequently-asked-questions.html . I hope this information helps answer your questions-- let me know if there's anything else we can help with, and thank you for your order! Rob Klingberg I think I'm just confused about the PF version simultaneously needing power supplies and batteries.